One feature of the software that you may not know about is embedding HTML. Since Maintenance Connection is a browser-based software, the system lends itself to this feature and it can be used to greatly enhance the display of information. Take for example the work order tasks that are added to the work order from the associated procedure. 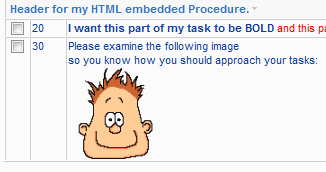 You can modify the task on the procedure to include text formatting (Color, Bold, Italic, etc) or images. If you add the following HTML to the Task, the system will use it to format the information. <B>I want this part of my task to be BOLD</B><font color=”red”> and this part RED</font>, but I want the rest to be normal. If you use the following syntax, you can embed images into the tasks to help emphasize your task information. When a work order is created with this procedure/tasks list, all of the formatting will come across with it. HTML can be used in a variety of places in addition to tasks. You can use it in the report custom expressions, in various text fields like the Reason field of the work order module, and in pretty much any Name or Description field. All you need is a little knowledge of HTML syntax and you can begin enhancing your information views. If you have any questions on the specific uses of the above information, please contact our support team for assistance.